A tale of consumerism gone mad, and a terrific twist on the YA dystopian genre. Feed blends the realities of teenage friendships with a rather sinister vision of a future where capitalism has been pushed to its most extreme. This was my second read of this novel, the first being in 2012, and I enjoyed it just as much the second time around. 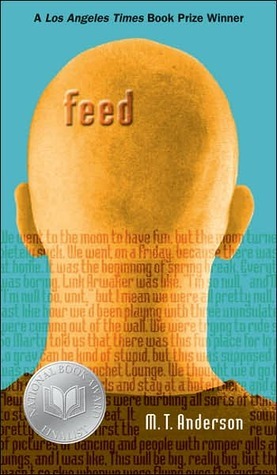 Feed is set in a near-future where American children have an electronic ‘feed’ implanted into their brains. This embedded machine grows with them and takes over many of their basic functions, to the point that being able to read, write and even speak out loud is considered strange. Everyone with a feed is constantly assaulted with advertising banners and slogans based off detailed consumer profiles, profiles that people are forced to conform to. All the while the world is dying. There are no more forests, meat is genetically engineered to grow in huge slabs, and people’s skin falling off due to disease is marketed as the latest thing in ‘fashion’. Very few people notice the world is dying, so driven to distraction are they. Welcome to the world of ‘Feed’. M T Anderson draws on a whole host of classic dystopian science fiction writing to pull off this engaging Young Adult novel. I was reminded strongly of Huxley’s ‘Brave New World’, Pohl’s ‘Space Merchants’ and Bradbury’s ‘Fahrenheit 451’ in particular, but there were shades of many others. I really enjoyed the way these influences are drawn together to create a rather terrifying vision of the future, and to critique the present day. Sci-fi novels of this style, with imaginings of future technology, don’t always age well, but I think Feed is an exception to this. If anything Feed is now more relevant, as the realities of meta-data and consumer profiling are far more developed and pervasive than in 2002 when this was first published. One of the things which makes this book a challenging read in parts, and which might put some reads off, is the colloquial style of writing. Filled with ‘modern’ slang and teenage expressions, the dialogue can be a little puzzling in places, and irritating in others. But I found this to be a positive overall, giving the book a really strong narrative voice that was consistent throughout. Anderson is clear in comments at the end of the book that it is his intention that ‘Feed’ is read as an allegorical tale, and it is certainly one which will be on my mind for quite some time. I recommend it for teens interested in exploring sci-fi, or a change of pace from the deluge of YA dytopias on the market these days.